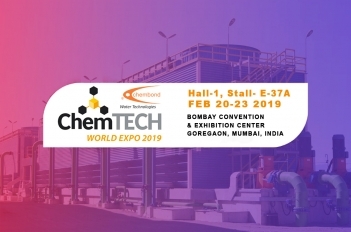 Chembond Group announces that it would be a Support Partner for the upcoming Chemtech World Expo 2019 exhibitions and conference organized by Chemtech Foundation in association with Jasubhai Media. To be held from the 20th to 23rd February 2019 at NSE Ground, Goregaon, Mumbai, this is focused on innovation and technology. Chembond would introduce its range of solutions for the Chemicals industry. "By participating in this exhibition, we would interact with our clients and seek their requirement and provide our solutions, added Mr. Vinod Deshpande, Group Vice-President for Chembond Chemicals Limited. "We focus on problem-solving, learning from customers, specifiers, and influencers and sharing our experiences and knowledge with them. Our product range is developed considering this feedback. We seek new opportunities of partnering with our customers and growing with them all the time" informs Suresh Krishnani, National Sales Manager, Chembond Water Technologies Limited." Chembond Chemicals Limited (BSE: CHEMBOND) is a 40-year-old known name in India, manufacturing a diverse range of specialty chemicals like water treatment, polymers, construction chemicals, high-performance coatings, animal nutrition, and industrial biotech products. The company is a pioneer of non-chromate cooling water treatment chemicals in India, introducing these products in 1980. Since then, the company has grown its product range to offer the entire range of water treatment chemicals namely boiler water treatment chemicals, membrane treatment chemicals, raw water, and effluent treatment polymers and defoamers.